Recently I was browsing online and came across the phrase ‘amaro highballs’. There weren’t any recipes or guidelines, just the phrase, which was all I needed to start me thinking about what would fall under that category. Amaro is Italian for bitter, and for this post I am specifically focusing on Italian Amari. So Amer Picon and Becherovka have to sit out this round (but not to worry, they’ll be back on here soon!). Usually used as a digestif (after dinner to help aid in digestion), these bitter liqueurs also make for great bases in cocktails. They range from mildly bitter to the insane, cough-syrupy varieties and may take some getting used to. Use this as a gateway to explore and add one to your liquor cabinet; it’s worth it. I also wanted to focus on some lower alcohol content drinks for the Holiday season. I don’t know about you, but my normal intake of cocktails in a night somehow skyrockets during the holiday season (stress??) and I find that if I make myself a drink with a lower ABV I can convince myself it’s just like drinking water… flavorful water. Not all Amari though have a low alcohol content, so read your bottles! You can always adjust to your liking and below I have two choices under 40ABV (although just marginally on the second recipe). In a highball glass, build your drink by adding ice, then the Averna, lemon juice, bitters and then Q-Ginger. Express lemon peel oil over the drink and garnish on glass. Straw optional. Averna is sweet and slightly syrupy, a gateway amaro with less bitterness, and here the sharpness of the ginger cuts through the sweetness to balance it out. The tiki bitters bring out more of the spice that is there while the lemon adds citrus to the nose and lingers in the background of the drink. In a highball glass, build your drink by adding ice, then the Fernet Branca, orgeat, and tonic water. Express grapefruit peel oil over the drink and garnish on glass. Straw optional. 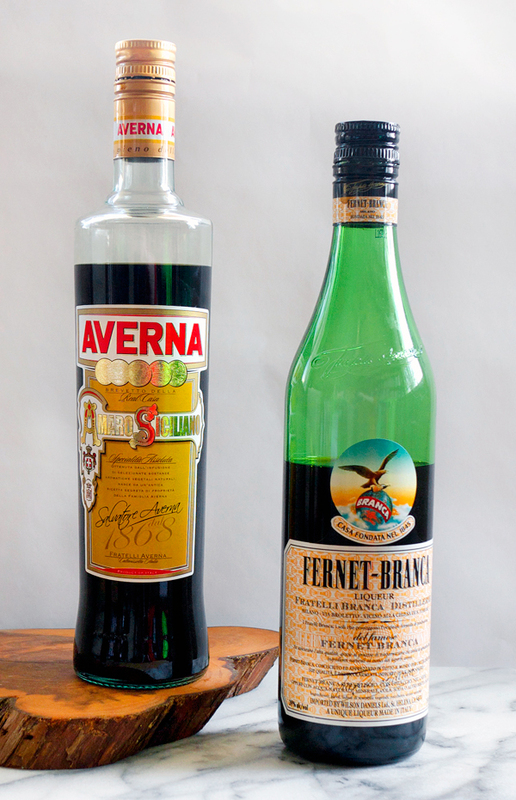 Fernet Branca is on the crazier side of the amaro scale with a very strong and distinct flavor. There’s some minty, bittery… gosh, I dunno, there’s a lot going on with that liqueur and although it’s clearly the star flavor, it’s cut back a bit by the almond-sweet orgeat and mellowed with the tonic. The effervescent nature of the tonic works incredibly well with the Fernet Branca and it disperses the grapefruit oil through out offering a slightly citrusy bitterness to the drink. It’s layers of bitter and sweetness in this glass. 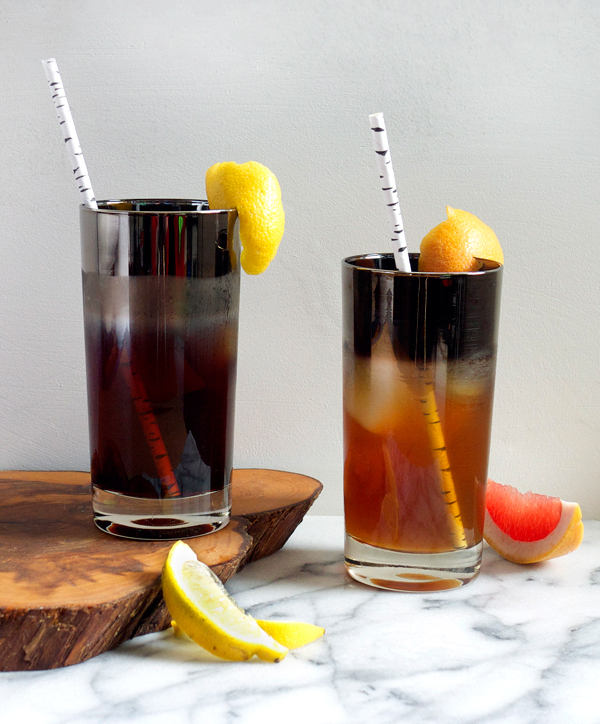 One aspect that makes both these drinks versatile is that they work in warm and cold weather. They are both refreshing when it’s hot out, but also have a lot of spice that works well when it’s cold. If you venture to try one of these, let me know what you think. First time with an amaro? Awesome! Welcome to the club. I must try! Can you tell me where you picked up those cute aspen straws? When I read this a few days back I wanted to just paste that photo of the Fernet & Averna cars I took on Sunday. So weird. I believe its the cocktail equivalent of seeing Jesus in a piece of toast. If you can’t just copy and paste stuff on the internet then the internet is broken. Hi Elana–what a great post! Here’s another recipe you might enjoy. Fill a cocktail shaker and a rocks glass with ice. To the cocktail shaker, add Averna, Campari and Dimmi. Stir well and strain into glass. Add bitters, top with ginger beer and garnish with orange. Hello ! Nice recipes. Do You use ginger beer or ale? The Q-ginger is a type of ginger ale. Love these recipes. One day I ran out of Fernet Branca and substituted Braulio which is a little less menthol-y and lower in alcohol (just over 20%, I believe). I also added a sprig of rosemary to the shaker. I found it to be a quite divine, especially as a summer day drink. Thanks! That’s sounds super tasty (and I’m always looking for ways to use more rosemary)!